Do you want to know when the next FIFA 18 Happy Hour will be released? You can find all the promo packs in this page. FIFA 18 Happy Hour times for FUT will be updated in real-time right here. EA will release many new promo pack offers into the FIFA 18 Ultimate Team store via the Web App, Companion App and your console at different times. It’s important to stay up-to-date on these offers as they massively influence player prices on the FUT transfer market. 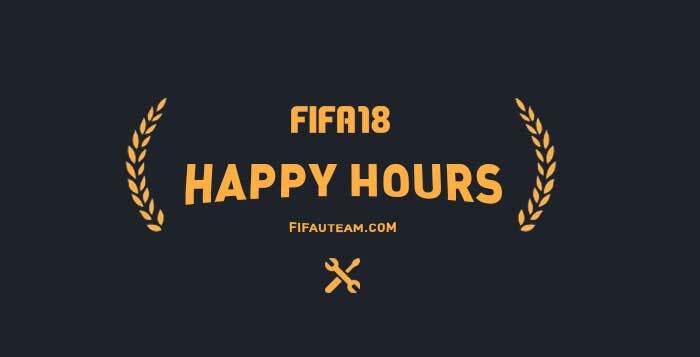 This page is updated every time it is announced a new FIFA 18 Happy Hour. We’ll update all the latest FIFA 18 Happy Hour times below, where the latest will appear at the top. Q: What is a FIFA 18 Happy Hour? A: A Happy Hour is a specific period of time while promo packs are available on the store. Regular packs are not cheaper during Happy Hours and the odds of getting an IF card are exactly the same, except for the 2x chance. They are not announced in advance. These special promotional packs are available for a limited time and will vary in terms of pack type, duration and limits. Q: What is a FIFA 18 Lightning Round? A: Lightning Rounds are pack offers that are released worldwide in limited quantities, first come, first served. They usually last 1 hour or until the packs run out, whichever is sooner. On another hand, without a limit of packs for each user, you are free to buy how many promo packs you want as long as they are not sold out. Q: Which special cards are available during FIFA 18 Happy Hours? A: This varies at different times. In this page, you’ll always find which informs or new players are available with each pack offer. Q: What are all the different pack types in FIFA 18? You can find a list of all the FIFA 18 Packs in our updated guide. Q: When are Happy Hours released in FIFA 18? A: There are times of the year that you’ll see a lot more special FUT promotional pack offers. These include TOTY, TOTS, Movember, Halloween, Black Friday, Cyber Monday, FUTmas, Lunar New Year, St. Patrick’s Day and FUT Birthday. Q: Will the FIFA 18 packs be available on mobile? A: There is no relation between the packs released for XBox, Playstation and PC, and the packs released for the FIFA Mobile. Q: Can I open packs on the Web or Companion app? A: Sure. cannot purchase FIFA points in any of the two apps, but you can redeem points or coins for packs in the store. when will they do a lightning round do you think? I think they will not do it during the Scream event. So when would that be? Also, is there a better chance of getting better players in packs with coins rather then buying fifa points? Probably only during Black Friday. The chances are the same ones. Any idea why there has been no gold promo packs released for over a week now? They don’t need to release promo packs because people are buying FIFA Points. They do it at the end of the month. Total waste using money/fifa points to buy the standard gold packs as it’s very rare to get anything of note from them. As we usually say: don’t buy packs.